AC Transit is doing all we can to reduce our own emissions. In the Bay Area, more air pollution comes from motor vehicles than from any other source. So every time someone takes public transit instead of a car, we can all breathe a little easier. By providing transit to over 172,000 riders every weekday, we are keeping tens of thousands of cars off the roads—and keeping their pollution out of the air. We’re also doing all we can to reduce our own emissions. 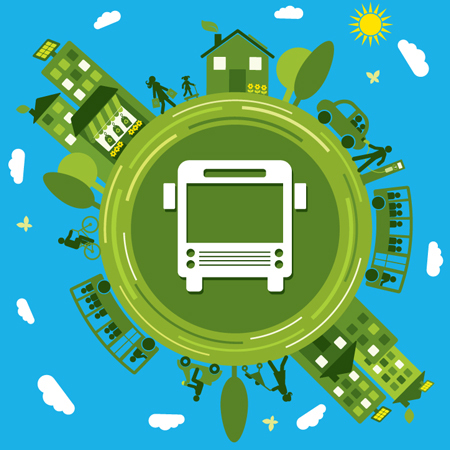 AC Transit has been an industry trailblazer in both the deployment and proactive use of zero-emission buses for daily revenue service. We currently run two hydrogen production and dispensing stations for our 13 hydrogen fuel cell buses, with plans to expand the fleet to 24 by mid-2019. We also have a fleet of 25 hybrid-electric buses. While not “true” zero emission vehicles in the way that the hydrogen buses are, they produce significantly less emissions than a standard diesel bus. AC Transit has 1,427 kW (DC) of installed solar in 7,032 panels located on an elevated trellis system in Hayward and on the rooftops of its CMF, Oakland and Hayward facilities. These solar systems deliver approximately 2,226 MWh of power per year—a significant portion of what is required to operate each facility. By the summer of 2019, AC Transit will receive five battery-electric buses with charging equipment. These buses will expand our clean vehicle infrastructure and provide valuable data comparing battery-electric-bus to fuel cell-electric-bus technology in order to determine what works best for our service.